- Once again, Asuka was not used on Smackdown except to hold back Charlotte and Becky Lynch during their brawl segment. However Asuka defeated Mandy Rose in a dark match prior tonight's taping. Sonya Deville was at ringside. Asuka won the match with the Asuka Lock. @stephaniemcmahon, I can’t deny the fact that you have been a driving force in the #WomensEvolution, everyone in the @wwe should be grateful for you - Including myself.... but like I said last night, the women’s evolution is about ALL of us. That title represents not the work of one person, but the accumulative effort of everyone woman that has ever pursued it. 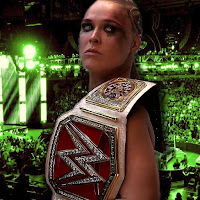 And as the new #RawWomensChampion it’s my charge to make sure every woman in that locker room get the respect she deserves, even from you @stephaniemcmahon.